January 02, 2018 at 6:49 pm. Marvin Lewis is staying with the Cincinnati Bengals after all. 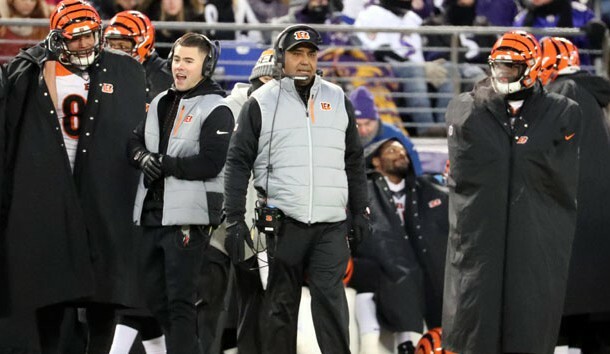 Ending weeks of speculation that his lengthy tenure as the Bengals’ head coach was over, Lewis was signed to a two-year contract that runs through the 2019 season, the team announced Tuesday. Although Lewis is the winningest coach in franchise history, posting a 125-112-3 record in his 15 seasons, Cincinnati has had back-to-back losing seasons following a run of four consecutive seasons with double-digit victories. The Bengals finished 7-9 but won their final two games. –Arizona Cardinals quarterback Carson Palmer announced his retirement after 15 seasons in the NFL. The 38-year-old Palmer was named to the Pro Bowl three times, but his 2017 season was cut short by a broken arm that limited him to seven games. Palmer was a Heisman Trophy winner at USC in 2002, and was the first overall pick in the 2003 NFL Draft. Palmer spent his first eight seasons with the Bengals before being traded to the Oakland Raiders. He played in Oakland for two years before playing five seasons with Arizona. –Minnesota Vikings quarterback Sam Bradford practiced with the team, marking his first participation in practice in nearly three months. The Vikings held the first of two practices Tuesday during their first-round bye, and Bradford went through drills with the other quarterbacks for the first time since early October. Bradford underwent knee surgery on Nov. 7 and was placed on injured reserve. Bradford’s return to practice doesn’t mean he will return to game action soon. He first would need to be activated off the injured list to be eligible to play, and the Vikings have two healthy quarterbacks in Case Keenum and backup Teddy Bridgewater. –Green Bay Packer coach Mike McCarthy received a one-year contract extension during this past season, multiple outlets reported. McCarthy is under contract through the 2019 season. He would have been entering the final year of his contract in 2018 without an extension. The Packers fired defensive coordinator Dom Capers, inside linebackers coach Scott McCurley and defensive line coach Mike Trgovac. –Ted Thompson will remain as senior advisor to football operations with the Packers, the team announced. The move comes after the Packers announced that Thompson was out as the team’s general manager. The Packers also said they will begin an “immediate search” for their next general manager. –Jon Gruden now admits that he is a candidate for the Oakland Raiders’ head coaching job. Several news outlets, including ESPN, have reported that Gruden will be the Raiders’ next coach after Jack Del Rio was fired following Sunday’s game. However, there was not any solid evidence that Gruden, now an NFL analyst for ESPN, would be interested in the position until a report by Jerry McDonald from the Bay Area News Group confirmed it. –Pittsburgh Steelers wide receiver Antonio Brown is making progress as he recovers from a partially torn calf muscle, coach Mike Tomlin said. In fact, Tomlin said that Brown would be listed as questionable if the team was playing in the wild-card round this weekend. It suggests Brown has a good chance to play in the Steelers’ first playoff game on Jan. 14. –The Steelers announced that offensive coordinator Todd Haley suffered an injury in a fall but will be able to coach in the playoffs. The team did not say how Haley was injured, but NFL Network reported he injured hip in an altercation at a bar. According to the report, Haley was pushed outside a bar near Heinz Field on Sunday night following the Steelers’ victory over the Browns. Because of the injury, Haley may coach Pittsburgh’s Jan. 14 game from the booth instead of the sidelines as he usually does. –The Atlanta Falcons placed Andy Levitre on injured reserve after the left guard aggravated a left triceps injury, the team announced. Ben Garland will get the start for the Falcons in Saturday’s wild-card game against the Los Angeles Rams at Los Angeles Memorial Coliseum. –Philadelphia Eagles coach Doug Pederson underscored his support of quarterback Nick Foles. “My guy is Nick Foles, end of story,” Pederson texted to NFL Network Insider Ian Rapoport. The 28-year-old Foles completed 4 of 11 passes for 39 yards with an interception in limited action during Sunday’s 6-0 loss to the Dallas Cowboys. Earlier in the day, Pederson was asked whether he’d consider replacing Foles for Nate Sudfeld if the former struggles in next week’s playoff game. –Kansas City Chiefs running back Kareem Hunt was intent on winning the rushing title, so much so that the rookie smooth-talked his coach into letting him vie for the honor. Hunt didn’t take long in accomplishing the feat on Sunday, rushing for a 35-yard touchdown on his lone carry against the Denver Broncos. Hunt (1,327 rushing yards) needed just 14 yards to pass Los Angeles Rams running back Todd Gurley, who sat out his team’s regular-season finale. –Houston Texans quarterback Deshaun Watson is ahead of schedule as he recovers from a torn right anterior cruciate ligament, coach Bill O’Brien told reporters. Watson, who sustained the injury during a non-contact play in practice, could return in some capacity for the Texans’ organized team activities that span from mid-April until mid-June. –The Andy & Jordan Dalton Foundation received a significant boost in donations from an unlikely group of fans. Fans in Buffalo showed their appreciation to Andy Dalton by donating to the charitable foundation. The gesture comes on the heels of the Cincinnati Bengals quarterback tossing a 49-yard touchdown pass on Sunday that eliminated the Baltimore Ravens from postseason contention and sent the Bills into the playoffs for the first time since 1999.